New York City in early January is surprisingly the hottest place to be — at least in terms of the arts — when thousands of performing arts professionals from around the world gather in clubs, auditoriums, universities, museums, cultural centers and even assorted hotel rooms to attend cutting edge performances in music, theater and dance. These performances are an integral component of the Association of Performing Arts Professionals annual conference. From a music journalist's point of view, they are also an excellent way to experience the depth and breadth of the state of Latinx music by dividing one's time between several key events that take place during each year's APAP, which include, amongst others, Winter Jazzfest, Globalfest and the showcases presented by Secret Planet and Mundial Montreal. Latin jazz is as always well represented at the trailblazing week of Winter Jazzfest, and it was a treat to experience the muscular, edgy jazz of Mexican drummer and Grammy 2018 contender Antonio Sanchez (who also won a Grammy in 2016 for the soundtrack to Birdman). Also at Winter Jazzfest, another 2018 Grammy-nominee — for Best World Music Album — the marvelous Afro-flamenca and Latin Grammy winner Buika took us by storm, with her fierce, velvety voice, immense charisma and jazzy forays into reggae-tinged flamenco. The opener for Buika was Chilean Camila Meza, whose jazz guitar chops, juxtaposed with delicate vocals and touches of Latin and Brazilian folk, provided the framework for socially conscious tunes. Also at Winter Jazzfest, Barcelona's Alexis Cuadrado directed an ensemble of extraordinary musicians performing with verve and grace the score he composed for Charlie Chaplin's silent film The Immigrant. The showcases at Drom, the Lower East Side's premier global music club, are also always excellent sources of discovery. These include "Secret Planet", a night presented by two Brooklyn tastemakers: Barbés Club and Electric Cowbell Records (who just released Spanglish Fly's new album, one of Alt Latino's picks for great new music of 2018) and another night of global music offerings at Mundial Montreal's showcase. At Drom, we saw New York colombianos and tropical futurists Combo Chimbita deploy potent psychedelic trance cumbia as well as Guatemala's Doctor Nativo's Mayan beat infused hip hop. It's also never a bad idea to check out the offerings at the David Rubenstein Atrium at Lincoln Center, called the best venue to see live music in Manhattan. There, we were able to catch a lively set by Changui Majadero, a Cuban roots music band from Los Angeles that focuses on the classic and supremely danceable rhythms of Eastern Cuba. We closed our 2018 APAP experience with the one-night discovery mecca of Globalfest and its 12 bands in three venues in the heart of Times Square. The 15th edition of Globalfest, as usual, shared a feast of international rhythms which included the adventurous mariachi songstresses of New York's Mariachi Flor de Toloache, Cuban cigar-and-flute-wielding force-of-nature La Dame Blanche (a.k.a. 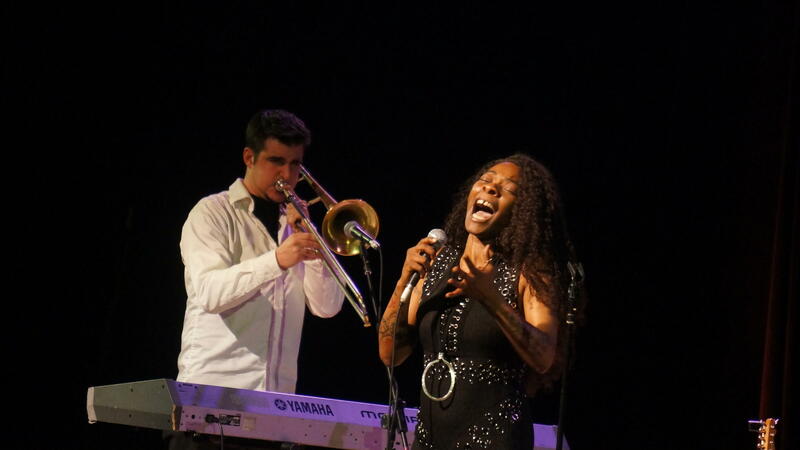 Yaité Ramos, daughter of Buena Vista Social Club's Musical Director Jesus "Aguaje" Ramos) and the exquisitely-executed Puerto-Rican bolero style torch songs of Miramar. So, we're here to say — as evidenced at APAP 2018 — the Latinx music scene is strong, vibrant and more eclectic than ever. Latinx artists are blurring the borders of genres, developing fresh takes on traditional music and above all crafting unique musical identities that take advantage of where they've come from in order to take the music places it's never been before. Check out the video playlist of our ten APAP 2018 highlights (in no particular order) and discover some favorites of your own!